It was Governors' morning today at St James's School, we toured both sites, visiting classes and participating in assembly - where, in Key Stage 2 ('the juniors'), the children had the chance to quiz the governors on their views. 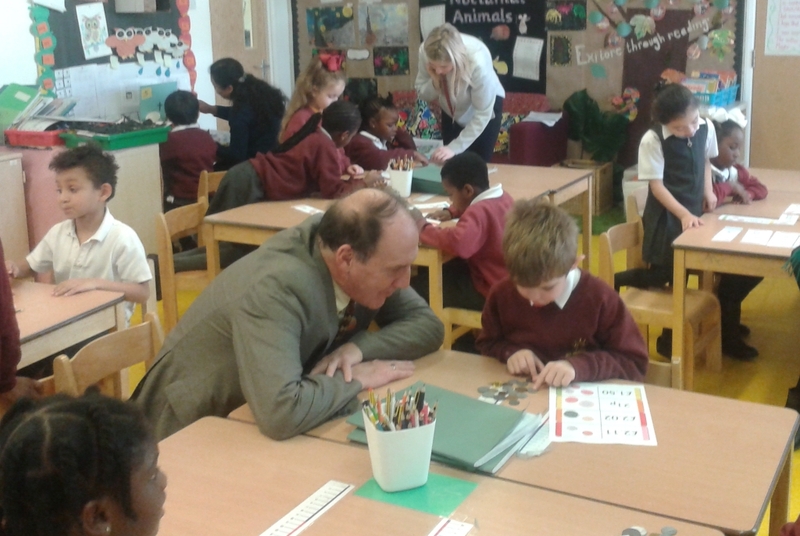 Here (above) is St James School Chair of Governors, Simon Hughes, getting stuck into some thorny maths problems in Key Stage one. There was really good work going on in every class. It was a most encouraging morning and made us all once again feel very thankful for our excellent teaching and support staff that make St James the school that is. 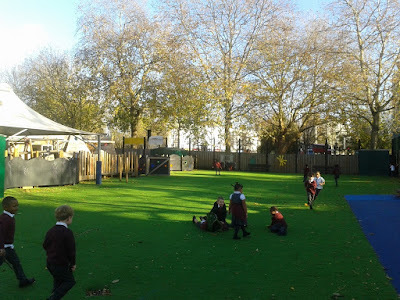 Back at the KS1 site in Old Jamaica Road it was great to see the newly-astro-turfed playground (above), which not only looks great, but offers a much more child-friendly play surface. I am told the incidence of grazed knees has dropped dramatically. This is quite a contrast with the drab expanses of tarmac that I remember from London school playgrounds in the 60s and 70s, so is the equipment available for play - being made full use of by the Reception children today (left). 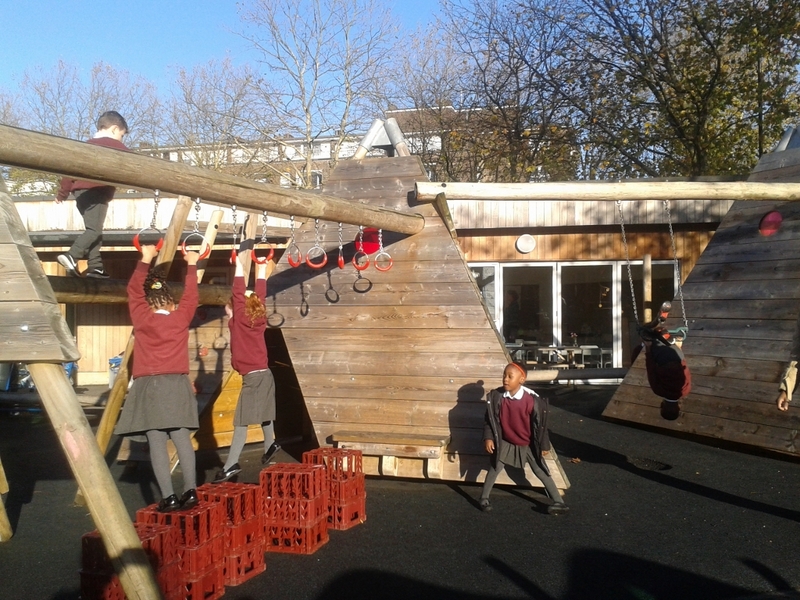 With 85 per cent of our parish living in flats, these open areas for recreation and play are a crucial enrichment for our children at St James, and it is heartening to see them looking so good. 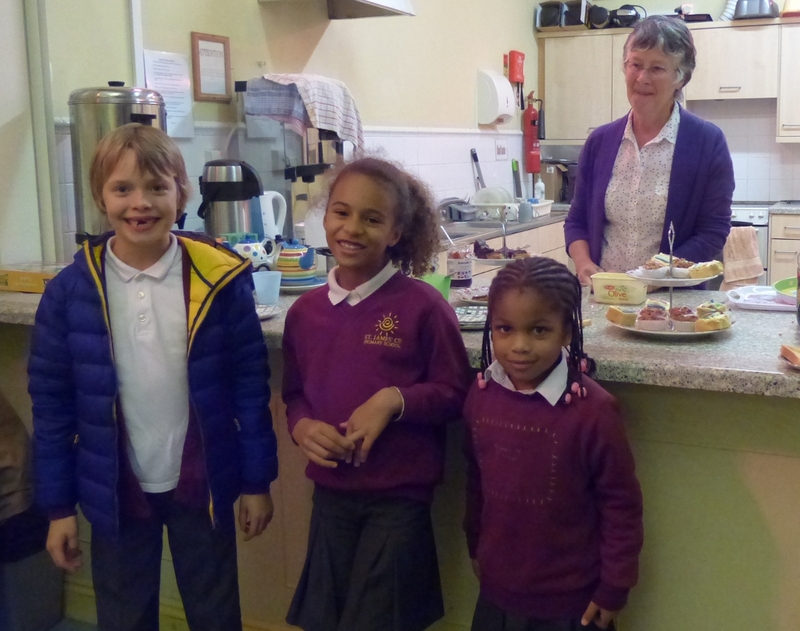 Also heartening was my meeting yesterday with the Junior Faith Group at Key Stage 2. 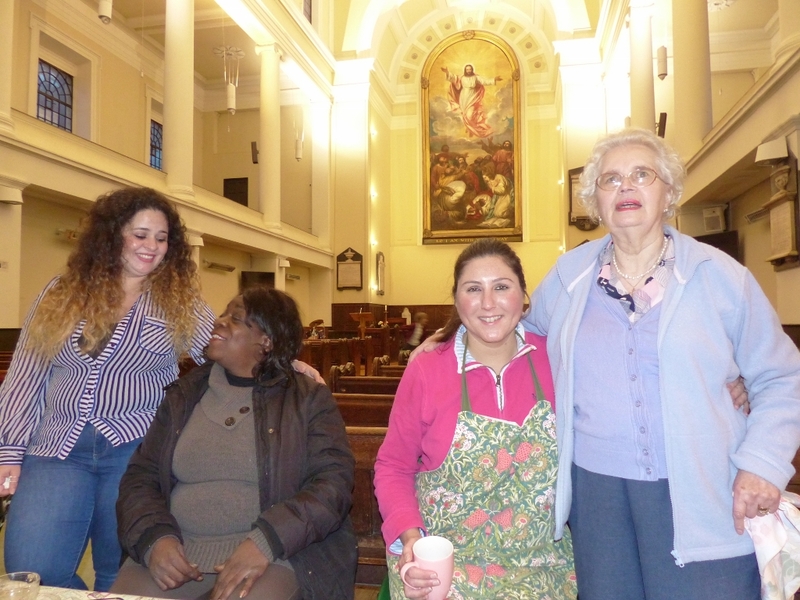 Some satisfied customers (left) at Bermondsey Brew, St James's Monday afternoon Community Cafe. Bermondsey Brew was the brainchild of St James members, Marian and Parisa, to provide a meeting point for people who are around during the day. Delicious home made cakes, tea in proper tea pots, nice coffee, and toys for the kids, makes for a warm and welcoming environment, for a growing number of people, some now regulars, and some just popping in for the first time. 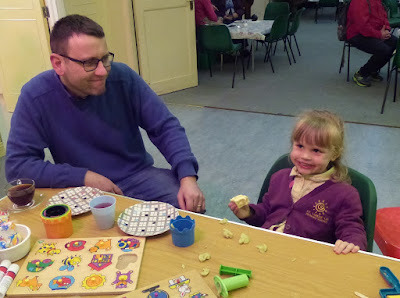 In the summer, lots of parents bring their kids to play in the churchyard after school, and many other people are just passing through - now there is a friendly welcome in church for them. And not just that, someone to talk to, and even pray with. 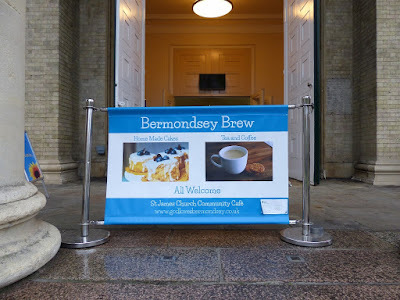 So if you haven't yet been - do come along to Bermondsey Brew on Mondays between 2.30pm and 4.30pm. 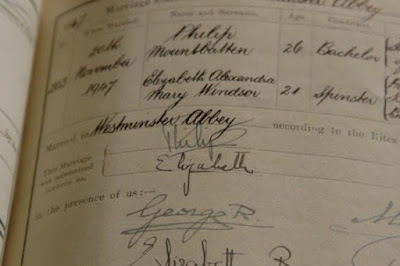 The Wedding Register from Westminster Abbey for 70 years ago today. Today the Queen and the Duke of Edinburgh reach a milestone that few couples ever reach: their platinum wedding anniversary. 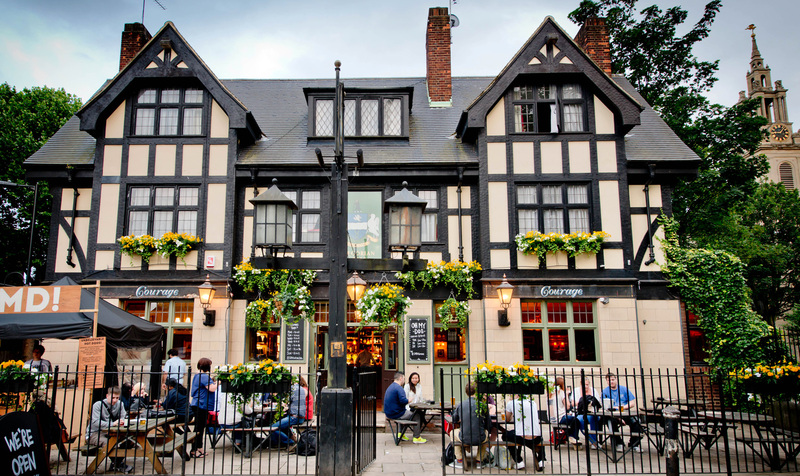 This afternoon at Bermondsey Brew we got talking about the royal marriage. 'What was the secret of their success' we asked ourselves. Then we had the answer: they kept their promise. That's a great prayer for any couple and its a great prayer to pray today for our Queen and her husband. 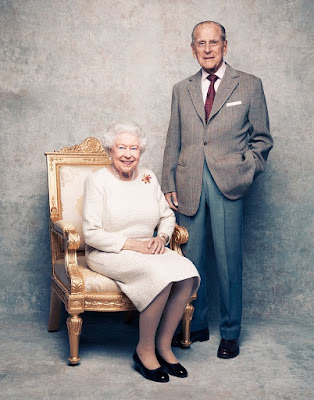 May God bless them richly. 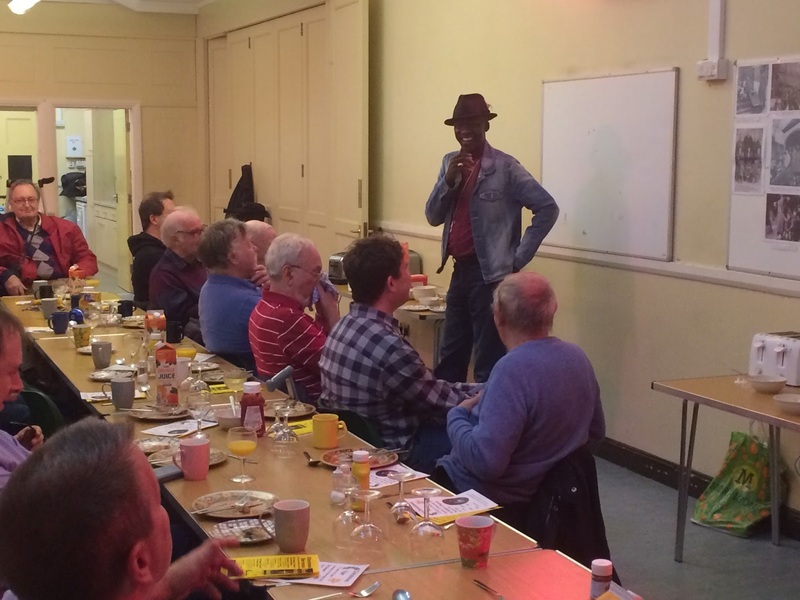 Bishop Karowei, the new Bishop of Woolwich, came to Bermondsey today to speak at the Men's Breakfast. "He told how at the age of 18 he thought he had everything in life all worked out. Then something happened that changed his life completely. He met a girl and wanted to go out with her. They first become friends and then she asked if she could introduce him to her best friend. Thinking this would bring them closer together he agreed. The best friend was Jesus. 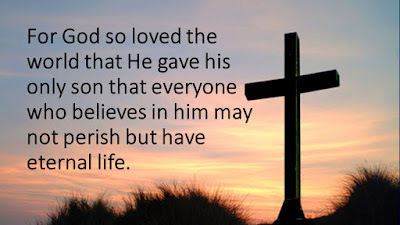 She shared with him from John 14 where Jesus says he is ‘the way truth and the life’. 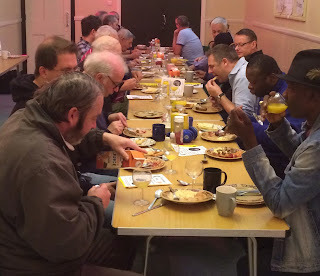 This brought him to realise that he needed to put his trust in Jesus rather than in himself. From that point on his life was changed forever. One of the questions that was asked was “did he marry the girl”? The bishop said the funny thing was that after she shared the verse from John with him he never saw her again"
Congratulations to our friend Henry Whyte, former vicar of St James, presented with the Lancelot Andrewes Medal for Godly Service and Zeal for the Gospel by Bishop Christopher. 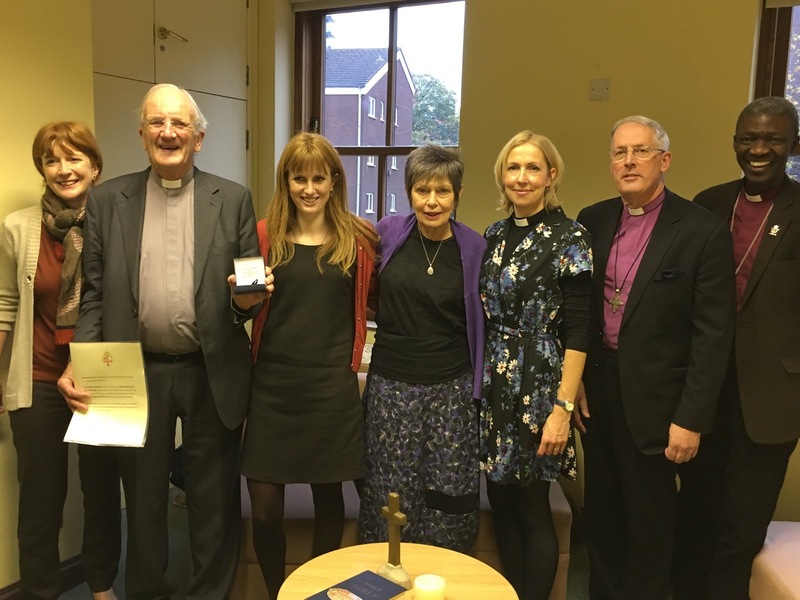 Warm congratulations, Henry, from all of us in Bermondsey on a well deserved recognition of your many years of service to the Gospel. (Photo tweeted by Good Shepherd, Lee). According to the BBC website Greggs have apologised for substituting a giant sausage roll for the baby Jesus in a new style nativity scene (left). For a minute I had to check it wasn't April 1st. 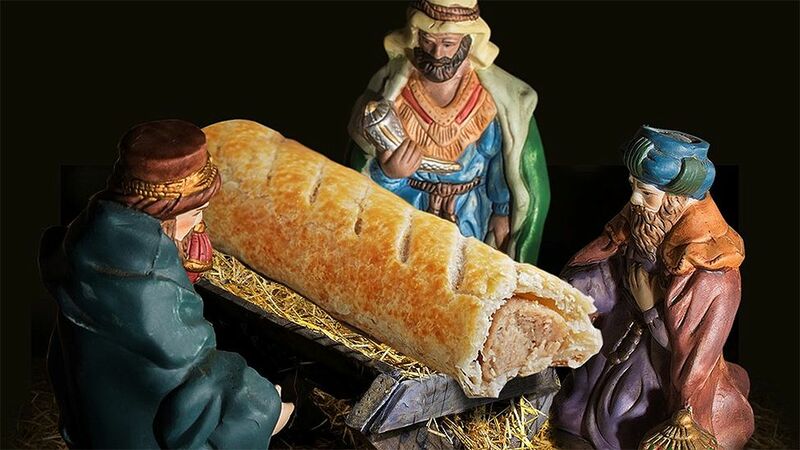 Greggs apologised for 'giving offence', but perhaps they have just given us all a very big laugh. 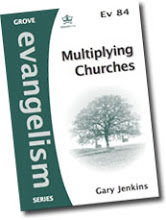 And much as I like a Greggs sausage roll, I'd rather have a saviour. Remembrance Sunday began with me leading an Act of Remembrance at the Queen's Regiment war memorial in Old Jamaica Rd (left). We were joined by local residents, veterans, and a detachment of Army Cadets. Wreaths were laid by Sir Simon Hughes, Neil Coyle MP, and representatives of Southwark Council and the Army. 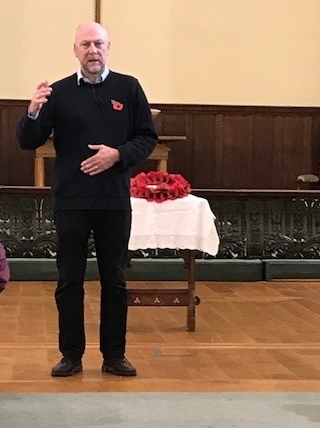 With St James's bells already ringing it was time to move back to the church for our main Remembrance Sunday Service, always well-attended by visitors, as it was today. For both services I wore on my preaching scarf the badge of the Royal Naval Association (right). 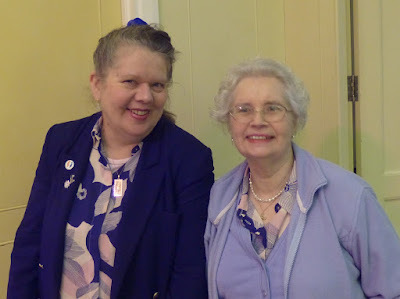 As I explained to the congregation I do this for two reasons: firstly, when I was Vicar of St Peter's St Helier I was chaplain of the Carshalton branch of the RNA and I like to recall the comrades from those days; and, secondly, because my Dad (below) served in the Royal Navy during the Second World War. Remembrance Sunday makes me think of him. 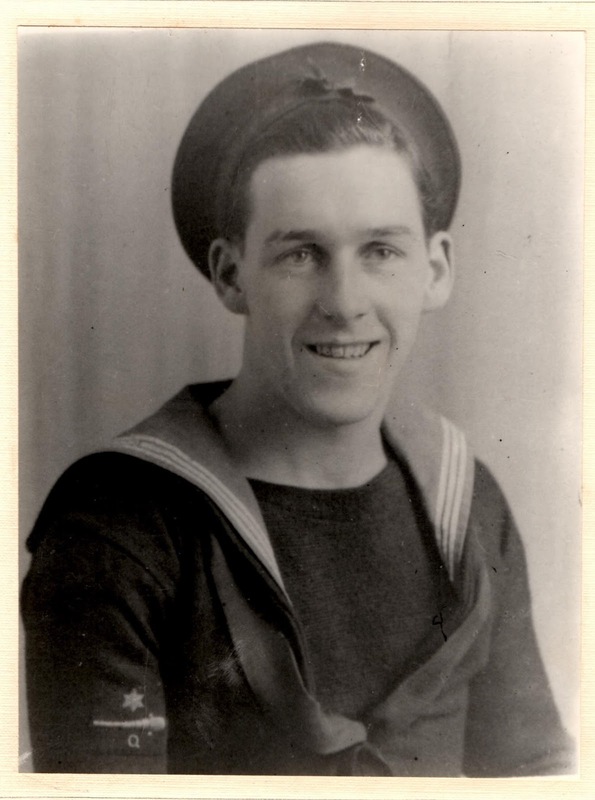 He joined the Navy as a 17 year old in 1939 and served for the whole of the war on destroyers in the Pacific, the Atlantic, and the Arctic oceans. 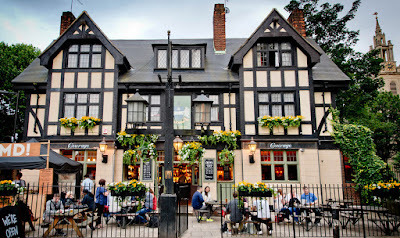 He was awarded six medals by HM Government (including the Burma Star and the 1939-1945 star for those who served the whole war), and, after the fall of communism, one from the Russian government for British sailors who had served in the Russian convoys. He virtually never spoke about his wartime service but, when I was 11, he gave me his medals. With Armistice Day falling on a Saturday this year, we had our Armistice service for St James's School a day early, today. Long term St James members, Abiola and Babalola, came to church today to thank God for their 20th wedding anniversary and to renew their wedding vows. Here they are pictured with the cake in the brilliant Autumn sunshine before the service. Then they said 'today in the presence of our family and friends, we affirm our continuing commitment to this vow.' Then we showed our support for them, as we prayed for them and applauded them. The Reformation celebrations have reminded me of our wonderful trip 'In the Footsteps of the Reformers' a few years ago, and of these Reformation beer mats which I have on my desk from a Wittenberg bierkeller. The ending of compulsory priestly celibacy was one of the immediate effects of the Reformation and many of the Reformers, like Luther, enthusiastically embraced the institution of marriage. With a married clergy came clergy families and that wonderful person: the Vicar's wife. On the same trip in the footsteps of the Reformers, I was delighted to see a whole exhibition devoted to the 'Protestant Vicarage' and to the contribution that clergy wives had made to church and nation since the days of the Reformation (see below). 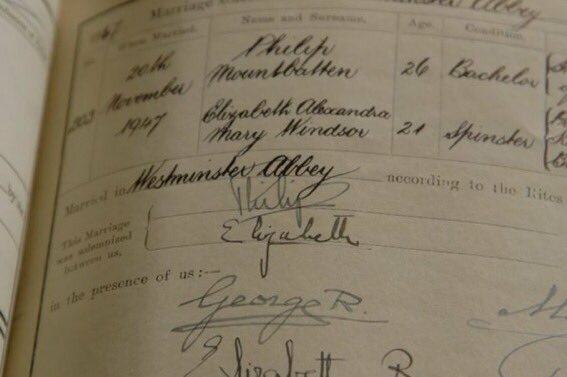 It's an interesting thought that both the Chancellor of Germany, and our own prime minister, are vicarage children.